for your school or event? I can do that! 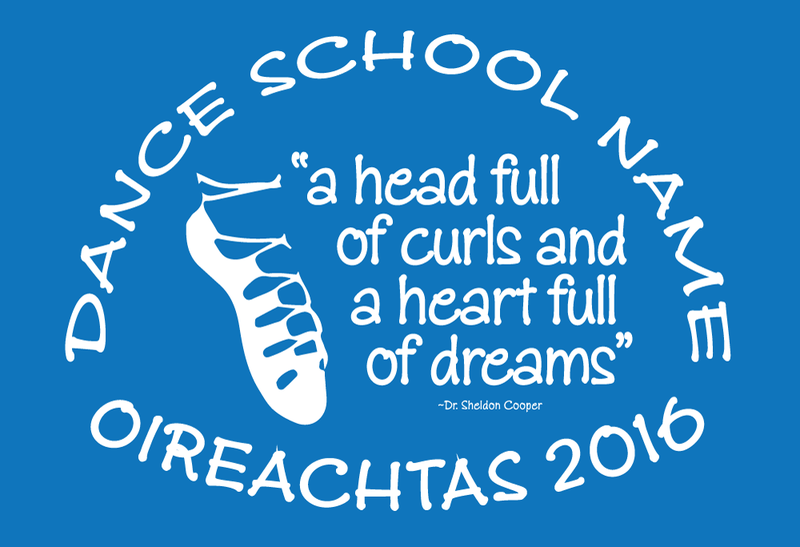 A Facebook follower contacted me and asked about me making shirts with one of my designs for Oireachtas 2016, and asked about having the dance school name and the dancer names added. I love that idea! Irish Dance T Shirt Company can add school and or dancer names to the back of any of our shirts, and if you have a minimum order, we may even consider customizing the design. You can see an example of the Head Full of Curls design with a fake school name and an event name added to the right. Almost any IDTCO design is available for customization. IDTCO designs can be used as is and printed on the front or back of shirts/tanks/hoodies. No minimum order required. Dancer or school names can be added for an additional cost in a standard san serif font. No minimums. Minimum order is required for a customized design like the one shown. Placement of custom info is up to the discretion of IDTCO to ensure the best visual appeal, and to adhere to printing considerations. 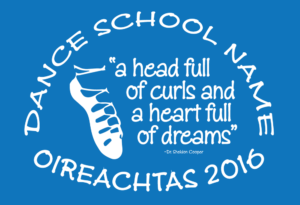 For Irish Dance events (like Oireachtas) where several schools may be represented, each design will be sold to only one school for the event, on a first come first serve basis. Other IDTCO designs can be sold for the same event, but only one of each will be represented. IDTCO can do design work for the other side of the item, like a list of dancer names for example, to match the look and feel of the selected design at an additional cost. Design licensing (buying a design outright) to one customer may be considered, but previous purchasers will not be affected. Maybe you are interested in getting your own custom design from IDTCO. Well, I made one for Irish Dance Magazine, and I would love to create one for you. Use the steps in getting started below or just contact me and we can chat about it. The design you are interested – REMEMBER, first come first serve if it is for a particular event. With this info, I will send you a quote, and we can go from there.